Written by John D. McKinnon and Thomas Gryta — Time Warner’s licenses from the Federal Communications Commission could prompt an agency review of its deal with AT&T. AT&T Inc.’s blockbuster acquisition appears likely to face a full-scale review by the Federal Communications Commission because Time Warner Inc. holds dozens of licenses from the agency, experts and people involved in the deal said. An FCC review—focusing on whether the deal is in the public interest—would subject it to a broader and potentially tougher examination than the antitrust review that already is expected by the Justice Department. The $85.4 billion deal, agreed upon Saturday, involves only a single FCC broadcast television license, for an Atlanta station owned by Time Warner. That led many on Wall Street and in Washington to speculate that an FCC review could be avoided if that particular license is sold. But FCC licensing records also show dozens of active satellite, wireless and radio licenses held by Time Warner operations including HBO, CNN and Turner Broadcasting. The licenses themselves say they cannot be transferred without permission of the FCC. Some concerned lawmakers already have started pushing for an FCC review. “As the chief federal watchdog for telecommunications, the FCC should be unleashed on this merger to protect consumers,” Sen. Richard Blumenthal (D., Conn.), a member of the Senate antitrust subcommittee, said on Wednesday. Although the FCC’s mandate is to regulate U.S. airwaves, it has used past merger reviews to impose conditions on other parts of the industry. For example, the FCC required AT&T to further build out its broadband network when it blessed its $49 billion purchase of satellite-TV provider DirecTV last year. While sales of broadcast TV stations or cellular spectrum are closely scrubbed, the transfer of satellite licenses such as those used by CNN or HBO historically has required only pro forma review by the FCC, said Christopher Yoo, an antitrust expert at the University of Pennsylvania. “One way or another, I expect the FCC to be very engaged in evaluating the competitive concerns with this deal,” said Gene Kimmelman, the president of high-tech public-interest group Public Knowledge and a former Justice Department antitrust official. AT&T and Time Warner have played down concerns the deal wouldn’t get regulatory approval. The companies have argued that prices won’t rise from the combination and the merger will bring new competition to the cable television and advertising markets. 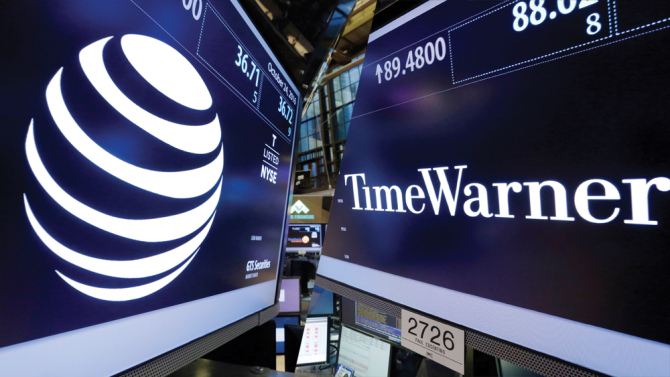 However, shares of Time Warner are trading at a wide discount to AT&T’s takeover price, suggesting Wall Street is worried about the transaction closing. FCC Chairman Tom Wheeler has sought to bring more competition to broadband and other services where local cable companies often dominate, but he has also taken a tough stance on both consolidation and regulation of the telecom and cable industries. Multiple people close to Mr. Wheeler said he may stay in the chairmanship role well into 2017 if Hillary Clinton wins the White House. But Mr. Wheeler’s tenure might not stretch as long as a potential FCC review of the deal.